West Ham drew with West Brom today, 2-2, in a very cold weather Premier League match in the London Stadium. The pairing of the 8thand 9th teams in the league had great implications for both sides seeking to sneak into European play next season. The big news of the week was that the hosts would be without Andy Carroll up top. He picked up a groin injury and did not train all week. In the added time of the first half, there was more referee controversy as Snodgrass was taken down in the penalty area by Livermore, however Michael Oliver did not see an infraction in that challenge and play continued until the end of half. At the opening of the second half, Bilic brought on Jonathon Calleri on for Aaron Cresswell to add to the attack, and to spell Cresswell who had been injured during the previous week. The added striker helped. 63 minutes in and Lanzini shot from beyond the penalty area. His strike hit the crossbar, and Foster was unable to collect it. This time Feghouli volleyed the rebound off the bar around the goalkeeper to level the match 1-1. Late in the match, Manual Lanzini took another pass from Feghouli and the Argentinian fired into goal from 24 yards out. Without Carroll inside the box taking the crosses, both West Ham goals have depended on Lanzini taking shots from distance, as the Baggie’s central defenders were too physical to give Callari any decent chance. 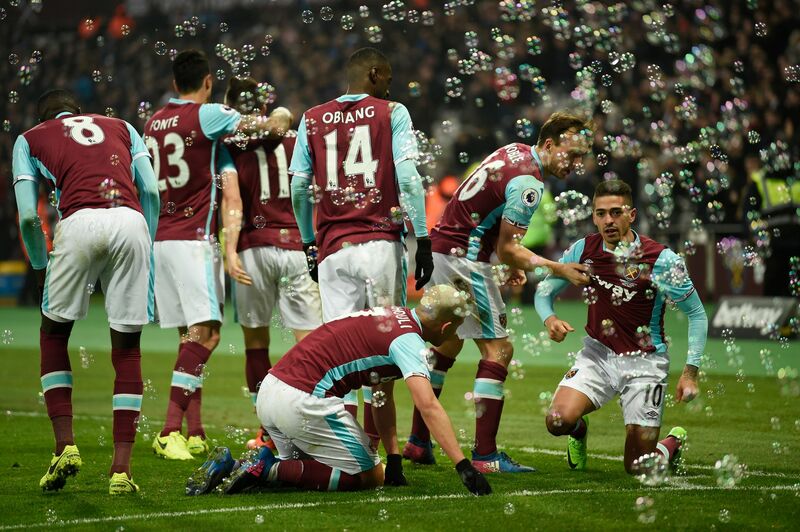 During the added time, the London stadium celebration turned to horror as a final minute corner kick by Chris Brunt was headed into goal by Johnny Evans. Albion coming level with seconds remaining, and Slaven Bilic was incensed that the throw-in which led to the fateful corner kick was incorrectly awarded to the visiting club. For his dispute, Bilic was also ejected in the final minute of play. So West Ham surrenders two points late, but without Andy Carroll a draw is probably a fair result. The biggest question of the coming week will be whether Bilic and Jurcevic will be allowed to coach the next week’s match. In close matches it often seems that poor referee decisions have bitten this team over recent seasons. Certainly the FA will consider using some form of replay on close goal decisions someday. This was a match that the Hammers had to have to overtake another top ten rival, and simple and possibly incorrect decisions deprived West Ham of the three points they had to have. West Ham: Randolph, Kouyate, Fonte, Reid, Cresswell, Feghouli, Noble, Obiang, Snodgrass, Antonio, Lanzini. West Brom: Foster; Nyom, Dawson, McAuley, Brunt; Livermore, Fletcher (c); Chadli, Morrison, Phillips; Rondon.